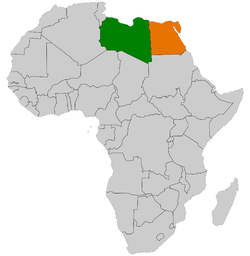 ... 1977 (35 years ago today), ceasefire ended a 4-day war between Libya and Egypt. The border skirmish had culminated several months of hostilities, stemming from the Libyan charge that its neighbor to the east, Egypt, was trying to provoke violence in order to take over Libya's oil fields; Egypt contested the charge. In a few short days of conflict, "both countries had suffered heavy losses of men and material."